Your data will only be used for the administration of this campaign. Specifically, it will be used select or notify a winner or notify an entry about the status of their submission. If you opt-in to email marketing, you are agreeing to receive further marketing emails from the Sponsor. Total ARV of All Prizes: $22,350. NO PURCHASE NECESSARY. A PURCHASE WILL NOT INCREASE YOUR CHANCES OF WINNING THE PROMOTION. 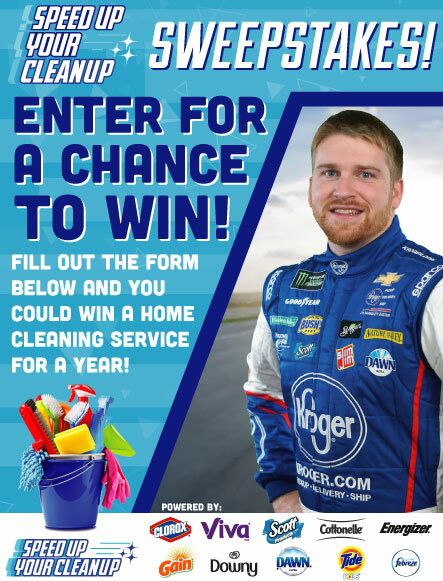 The “Speed Up Your Cleanup” Sweepstakes (“Sweepstakes”) is open to individual legal residents of the 48 contiguous United States and Washington, D.C. who are age of majority or older in their places of residence (age 21 in Mississippi; age 19 in Alabama and Nebraska; age 18 in other states and D.C.) by March 20, 2019. Enter 3/20/19 - 5/1/19. See OFFICIAL RULES for entry requirements, prize description and odds. No transfer, substitution, or cash equivalent for prizes allowed. Sweepstakes Entities reserve the right to substitute a prize with one of equal or greater value if a prize cannot be awarded as described for any reason. Sponsors: Brand Activation Maximizer. Please note Facebook like is not a mandatory step and it doesn't increase your chances of winning.